This is the first edition of my Collection of Now series! OK, so technically Winter doesn’t start for another three weeks. To me Winter starts on December 1st, so I’m celebrating it on Saturday. I’m making a conscious effort to get into the Christmas spirit because I know that if I don’t make it happen, the season will just pass me by like it did last year. I’m always inspired by Ashley over at Happy, Pretty, Sweet and her Life Lately posts, so I figured I’d give it a shot. So, I realized the absurdity of posting about having a behavioral disorder on Monday and then posting my Vegetarian Chicken Soup recipe on Wednesday. It’s like, hey I’m really going through something here, and oh yeah check out my soup! Honestly, it’s a great representation of how my brain works, and what is a blog if not the repository for all the stuff in that big bag of weird we call our brains? I also hooked up with Top Mommy Blogs, check it out and if you want to vote for me, click on the vote picture, if you just want to check it out, click on the pic on the right :). And I reconnected with Influenster. I’ve already earned $10 in Kohl’s cash for participating in the Kohls Virtual Vox Box, woot! Recently I picked up a book called Safety 24/7. It was recommended to me by a safety specialist that I trained. He said it changed the way he viewed safety, so I bought the book for my team and an extra for myself. It’s a pretty good read, and has actually inspired me to start writing my own safety book. I’ve been in safety for over 9 years, I have a masters in education, and I love to write. I don’t know why I never thought of writing a book on safety before, but this book has definitely inspired me. I’ve also been reading Empire Falls by Richard Russo for a while…a. while. And I have about 100 pages left. This book is so well written, I really enjoy Richard Russo’s storytelling. I am obsessed with subscription boxes. This month I got my Ipsy Glam Bag as well as my first Birchbox, and I did a Fall Box Swap with Carissa at The Green Eyed Lady Blog. AND I finally signed up for Stitch Fix! Holy moly, I’m actually a little nervous about this one. My first delivery is on the fifth of December, early Christmas present! I’ll definitely be posting the look they send me. It’s just time to elevate my look and I’m tired of looking like a scrub all the time. My job is super casual, and it’s spread to the rest of my life. I only own one pair of flats, and I have no shirts that can actually be categorized as a blouse. //These are all affiliate links, meaning that if you sign up for any of the programs, I’ll get some bonus points, or something similar, at no additional cost or obligation to you. If you’re interested in signing up for anything, and want more information let me know! Tricia at Chocolate Musings has been a huge inspiration for me. She writes about rediscovering her art through bullet journaling, and she’s inspired me to do the same. I honestly forgot about my visually artistic side. I’d been hiding behind intimidation, and self-doubt, until very recently and now I feel like my former artist self is beginning to reemerge. I drew this while I was watching the penultimate episode of The Punisher on Netflix. Have you seen this series? I am a huge fan of the Netflix Daredevil series and this is honestly a close second. Eric fell asleep before we could watch the finale, which is admittedly torturous. I love collection pages, and have been wanting to draw my very own for a while. I’m really happy with the way this page came out. I watched my first Christmas movie of the season with Jack and Lorelai, and filled in my first ornament. Lorelai cutting a rug at her elementary school dance. Getting out of work before the sun completely sets, and seeing a beautiful site like this. Turkey hats making everyone look amazing. Jackie carving our Tofurkey on Thanksgiving. 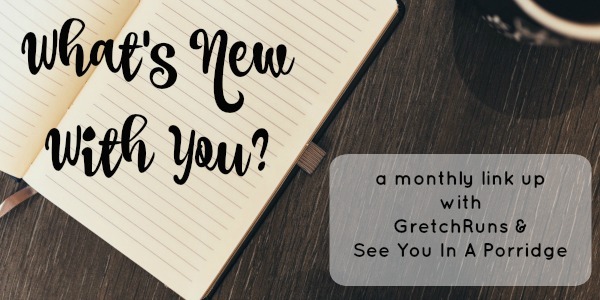 I’m planning on linking this post up with the What’s New With You link up in December and It’ll be linked up here and here. What’s new with you? Will you join the link up too? If you do, let me know I’d love to read your post! I’m visiting from Inspire Me Monday. I like your art sketch idea of Christmas ornaments and movie titles. Your inspired me to draw my own. 😉 Thank you and have a sketchtastic week! Ho-Ho-Ho! Thanks Cathy! I’m so glad you like it! If you post it to Instagram, send me the link so I can share it! ahh winter starts for me on december 1st too! haha glad i’m not the only one. but for me it’s because back home, summer starts on december 1, and all the seasons start on the 1st of this or that month, so i can’t wrap my head around seasons starting in the middle of the month. your drawing is awesome! we watched daredevil… i think we also watched the punisher but i don’t remember now. i know we watched jessica jones. your vegetarian thanksgiving looks delish! Thanks so much Kristen! Daredevil is still my favorite of all the Marvel Netflix shows. I was thinking I’ll have to do a drawing from that in season three, haha. The veggie Thanksgiving was so wonderful, every year I wonder why I don’t just cook meal that like every month! What a fun wrap up of life.